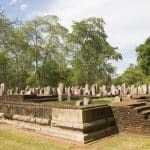 Situated at the center of the island, Sri Lanka’s Cultural Triangle links the ancient cities of Anuradhapura and Polonnaruwa, the rock fortress of Sigiriya, and the Dambulla Cave Temples, all UNESCO World Heritage Sites that span 2,500 years of history. 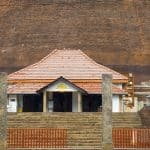 These ancient cities are the cradle from which Theravada Buddhism and Sri Lanka’s rich Sinhala culture spread throughout the country, and remain of extreme importance to practicing Buddhists today. Upon arrival at the Bandaranaike International Airport, you will be met by a Sri Lankan Airlines representative and accompanied through passport control, customs, baggage collection, and money exchange to the arrival lounge. Here, you will be introduced to your private guide and travel companion, who will address any last-minute questions you may have regarding your itinerary. Travel by car two hours northeast through vast coconut and pineapple plantations, passing through small villages, and sampling traditional Sri Lankan refreshments from a Tambili (coconut). The ancient city of Dambulla, home to Sri Lanka’s largest and most impressive cave temple, will be your first visit. The cave complex houses over 2,000 square meters of painted walls and ceilings, which closely follow the natural folds of the rock, and over 150 images of the Buddha–the largest being a colossal figure carved out of rock, and spanning 14 meters. 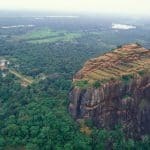 There are five separate caves, the largest of which date back to the first and second centuries BC, and a challenging walk to the top offers an expansive view of the surrounding jungle and Sigiriya Rock in the distance. You will have an opportunity to meditate near the caves. Your accomodation, situated on a 25-acre mango orchard, surrounded by rice fields and steep mountains, is rustic and serene. Rooms are comfortable and vibrant, and the cuisine is Sri Lankan fusion, comprised of natural and local ingredients. Wake up for a morning yoga session, followed by a fresh and full breakfast outdoors. Travel approximately two hours to Anuradhapnura, the capital city, and one of the most stable centers of political power on the island from the fourth century BC to the 11th century AD. For centuries, the city has remained sacred in the Buddhist world, and is surrounded by monasteries covering an area of 16 square miles. Spend the day exploring the city’s ruins, with the option to enjoy some meditation. Return to Dambulla late this afternoon, where you may enjoy a multi-course meal comprised of ingredients from the herb and vegetable garden on the hotel’s property. Depart your hotel early this morning after breakfast, to climb one of Sri Lanka’s most astonishing sites, the Sigiriya rock fortress, a massive monolith of red stone rising 600 feet from the green scrub jungle below. Originally a fifth century BC mountain monastery, the rock was constructed into a highly sophisticated palace during the fifth century AD, and, although the palace no longer exists, the paws of the great lion that guarded the entrance to the summit are still intact, while extensive gardens and a moat circle the base of the rock. The famous frescoes of the “Heavenly Maidens” of Sigiriya can be seen in a sheltered pocket of the rock when it is approached along a spiral stairway. Break for a typical Sri Lankan lunch of rice and curry, before traveling approximately an hour-and-a-half to Polonnaruwa, where you’ll spend the afternoon exploring the medieval capital city of the island. 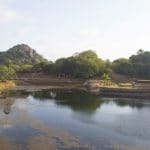 While the city is believed to have been inhabited as early as 667 AD, it wasn’t declared a capital until the looting and burning of Anuradhapura by the Cholas of South India in 993 AD. The city remains one of the best-planned archaeological relic sites in the country, and displays Hindu and Buddhist remnants that are awe-inspiring and exceedingly well preserved. Return to your accommodation late this afternoon, where you can enjoy a large dinner and time to relax outdoors. This morning, you will be transferred to the airport in time for your return flight, or to continue on to your next Willing Foot destination.